If the updates are real, how do I update, and if not, how do I get rid of the bubble? The App Store was having problems since yesterday afternoon. It was not your fault, the problem was on their end. But it is back now. I would try the following command in the terminal to download and install updates available for your mac. All commands below require administrator privileges and will prompt for your password which is NOT relayed to the screen. You will not see the caret move at all as you type it in or be replaced by "*" per character of your password. This is normal. This downloads and installs all available updates. If perhaps you have configured a different App Store catalog (Usually done in businesses) you can run the following command first and then the above command. You can run it anyway to restore the catalog to defaults if you're not sure. The first command I stated should download and install all updates but sometimes bugs happen and things don't work. Another attempt to solve the issue could be the following command first. Last possible option I can think off is to write that no updates are available. If there are updates available this won't fix that, but it'll change the updates available number. This may change the badge count. Sometimes nothing works, and a reinstall may be the best option. Steps below. Download MacOS Sierra from the app store. Run the following command after downloading Sierra to create a bootable USB. This may take a bit of time to copy onto the USB. Now, boot into recovery mode by holding down alt/option directly after starting up your mac. Here you will be presented with the USB option (Don't forget to plug keep it plugged in or it won't show up) NOTE If a firmware Password was set, you will be required to put it in to boot it up and choose a disk to boot from! Booting up to the USB will be like recovery mode and you can wipe your Mac's HD/SSD and reinstall a fresh clean copy of OS Sierra. Reinstalling via alt/option + command + r into the internet recovery (If available on your mac model) will revert and download and old OS that it came with out of Apple's Facility then to Sierra, so a bootable USB is a good option and you can keep it there for another use. Updating from the purchased tab on the app store fixed the problem. Go to System Preferences and search for Updates, activate Auto Update and the Updates will be downloaded -> automatically. I still don't see the available updates, but they have been updated and installed in the background. And since I guess, that this is just a temporary bug (it can't be coincidence, that thousands of users have the same issue simultaneously...) , this should work as work around. I've found that, when that happens, going to the "Purchases" tab will usually reveal that you've been logged out of the store somehow, and it will tell you you need to login again. Once you've done that, you'll be able to download updates. Not the answer you're looking for? Browse other questions tagged macos mac-appstore software-update dock sierra . 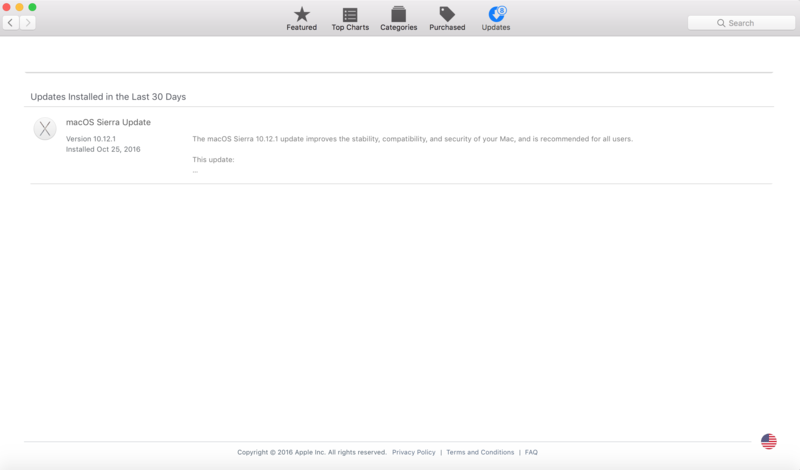 Ignore App Store updates in El Capitan? Why is a number of notifications showing up on one of my calendars?